The end of the year is one of the busiest times for many retailers, with some customers starting their Christmas shopping as early as October. More than half of British shoppers (51%) prefer to buy online than in-store according to a recent study from Empathy Broker, which is an excellent opportunity for many online retailers. Companies such as Next, Boohoo and John Lewis all saw an increase in online sales before Christmas last year. 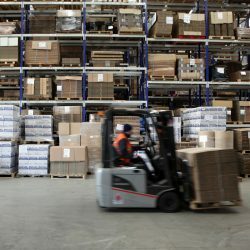 But the growing demand may also put a strain on resources and delivery capabilities, and customers are more demanding than ever before, wanting free delivery, a wider choice of delivery options, and late order acceptance times. With Christmas only seven weeks away, here are six tips to help your business prepare for increased demand. 1. Ensure you order all your packaging supplies well in advance to avoid running out of stock. 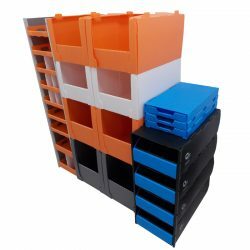 Temporary storage solutions such as bespoke pick bins will help organise your packing materials and maximise storage space at busy times without significant capital investment. 2. Introduce bespoke shadow packing boards that will help your packers choose the right packaging size for your products. They are custom-made to suit your packaging range and colour-coded, making it easier to identify the most-optimised solution for each product. 3. Make sure your packing benches contain all the essential packing materials your staff may need and consider automating some of your processes. For example, machine tape dispensers can be pre-set to cut specific lengths of tape, and overhead hoppers store and automatically release ready-to-use air cushions, significantly increasing your packing times. 4. Solutions such as pick trolleys will help you move packaging and products around your warehouse more efficiently, maximising productivity and facilitating warehouse logistics. 5. Staff training is key in ensuring your packing operation runs smoothly, especially if you employ temporary packers in times of increased demand. Ensure you have clear instructions regarding your packing processes and that your staff are familiar with and comfortable using equipment in your warehouse. 6. 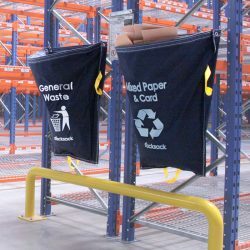 Rack sacks and packing station sacks allow for easy segregation of your warehouse waste, keeping your work areas tidy and making recycling simpler for your staff. 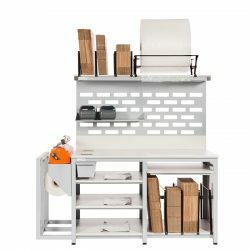 They can be attached to racking or workstations to save space and can be custom-printed to meet your waste segregation needs. If you need help to prepare your packaging operation for the festive season ahead or are looking for more packaging tips on how to improve your warehouse efficiency, contact Macfarlane Packaging today. We can offer bespoke packaging solutions to help meet your specific requirements as well as a wide range of standard packaging products.